Something more, however, happened: Quality trumped quantity. The non-linear trumped the linear. Agility trumped grand strategy. The concrete trumped the abstract. I’ve learned through experience not to ignore Dave Cline’s political intuition. 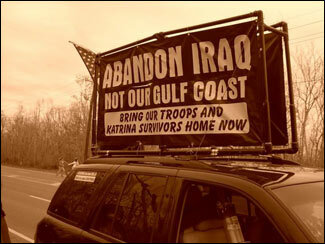 The size of this action—planned by VFP and Iraq Veterans Against the War (IVAW), and called by the Mobile AL chapter of VFP—began as around 100 participants and a dozen automobiles and swelled to over 300, with 49 motor vehicles and two bicycles. 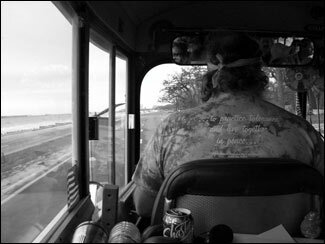 At one point, the 49 vehicles, headed by two full-grown buses, stretched down the shoulder of Gulf Coast Highway 90, emergency flashers rippling through the ranks like Christmas lights, giving the appearance of a train. 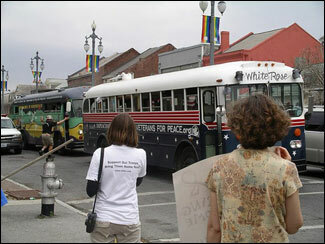 And so we gave this convoy the name, Gulf Coast Peace Train. We had to bypass sections of Highway 90 by automobile because the Highway is no longer intact. 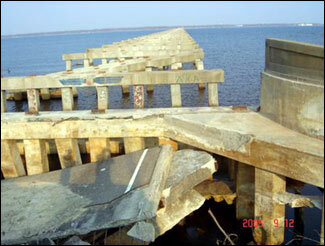 The huge heavy-duty bridges at Biloxi Bay and Bay St. Louis, designed to bear weight from above, had never anticipated the great storm surge that would roll up their flanks like a surprise attack and slam with inconceivable force not from above, but at an oblique angle from below. These two bridges now look like a malevolent giant played 52-pick-up with their spans. During the reconnaissance we conducted in January, these facts-on-the-ground altered our original vision of marching straightaway, 135 miles, from Mobile to New Orleans. 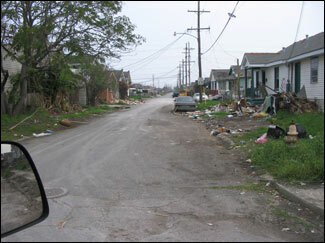 Along with downed bridges, we had seen the sodden, molding ghost town of New Orleans’ African American 9th Ward, the almost biblical reminders of vanity in the gutted casinos and shattered mansions of Gulf Port, and the post-atomic landscapes of Long Beach, Pass Christian, Bay St. Louis, and Waveland. Whatever we had planned, we then recognized, we were obliged to understand this pilgrimage as a journey of spirit-through-wreckage, and not some extravagant outing for a dose of spoon-fed podium politics. We were going there to learn about people rendered invisible, and about those unfamiliar psychic niches of our own, those places sought to make sense of actually walking through disorder of such magnitude that it seems to mock the very notion of order. We could plan it, but we could not control it. We would have to be willing in advance to surrender some of our agenda to the survivors who had neither the time nor the means to develop the plan. We would have to deal with the unexpected as expected. 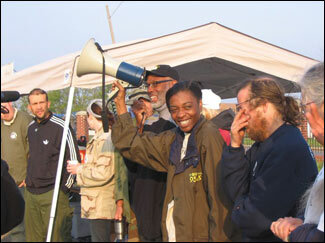 We would have to accept that we were not going to be big in number; that the great majority of war opponents are not deeply committed to the liberation of black and brown people; that the great majority of war opponents cannot drop their lives to engage in an action almost a week long; that clear instructions and warnings about hazardous terrain and air, about sleeping on the ground, bathing out of buckets, enduring insects, and walking blisters onto the soles of our feet would disincline hundreds, maybe thousands more from even considering this action to mark the third anniversary of the Bush administration’s invasion of Iraq. Risk became our capital, if the reader will forgive the metaphor. The planners would have to take the risk to allow the action to evolve organically, and the participants would have to risk not knowing exactly what the journey would look like, how it would function, what it would or would not accomplish, how much hardship or austerity it might entail, or how many people in the region—a region known for bloody episodes of reaction—might respond to this combined message confronting war, white supremacy, class, and gender. This differentiates a veteran-led action from the more typical antiwar and social justice actions. It is not majoritarian; and it is not risk-averse. Many of the people planning, leading, and participating in the march were those who had slept on the ground, bathed out of buckets, ate spare and simple food, endured clouds of flies and mosquitoes, and blistered their feet before—in the armed services of the Empire. Many of the rest—the families of military people—were willing to go there out of identification with the urgency of our task—to say that stopping this war is not enough, and assisting poor people this time is not enough. By combining them, we would say that we are again at war, this time with the very system that reproduces war and oppression. We could not know it during the reconnaissance, when Paul Robinson, President of the Mobile VFP Chapter, Vivian Felts of Savin’ Ourselves (SOS), Michael Cuzzort of New Orleans IVAW, Ward Reilly of Vietnam Veterans Against the War (VVAW) from Baton Rouge, Marty Rowland of C-3 New Orleans, and myself were conducting this recon in January, that we would in less than two months move the equivalent of a mechanized battalion across three states. There was much I could not anticipate, but I especially never anticipated the cars…all those cars. Paul on the bullhorn, and Vivian holding it. We knew the march-caravan would have a military character. We said so. We said we were building a Justice Army and marching it into the heart of a great injustice. We said that even when we weren’t yet sure we could do it. We did not have enough time. We did not have enough money. We did it anyway. Elliott and I ran the route once more over the next three days, as well as rescued one of our buses from the side of the highway, pulled one forklift out of the mud where it was mired (Paul was in on this adventure), ran down port-a-potty contracts, and conducted inventories of the food, vehicles, and equipment we had assembled. 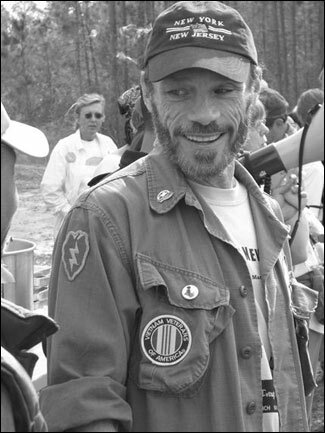 Vivian, Paul, and Elliott were still negotiating permits and hosting until the 13th when marchers began to arrive at the SOS warehouse in Prichard AL. 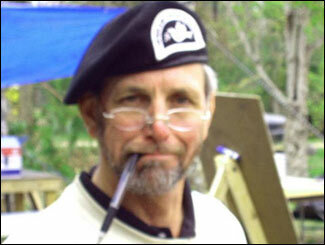 Mike McGuire came on the 11th as a volunteer to run advance set-up of the camps. 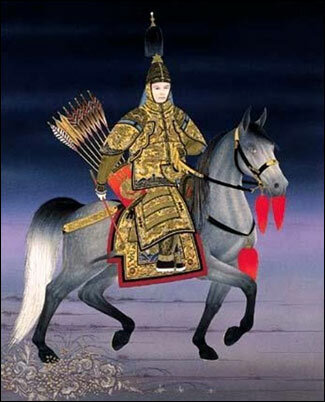 This notion was one I cribbed from Ghengis Khan, the nom de geurre of the Mongol, Temujin. Modern armies drag their logistical tails along with them or behind them, seizing territory then setting themselves up afterward for sustained operations. The Mongols sent their logistics ahead. Mobile armies have no intention of staying long. Often the mere arrival of their supply trains in advance of the army would be enough to compel capitulation upon arrival. We, of course, came in peace and for peace, but the concept seemed somehow appropriate. Territory, however, was definitely on the agenda. Territory: from terra, meaning soil or land. The ruling class loves it when we struggle over policy, because abstraction always works in their favor. They love it when we fight for an issue and not a program, because they can throw up more initiatives than we have to power to confront. Home were the twin demands: Bring the troops HOME. Bring the survivors HOME. Bring us to our sense of place. The basis of the struggle for social transformation is the struggle to assert POPULAR sovereignty against elite sovereignty. Soldiers fight for territory, taking it from others, defending their own, or defending the territory of others. 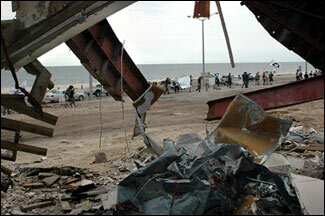 We wanted to strike the first of many blows to defend the sovereignty of both Iraq and the residents of the Gulf Coast. We adopted non-violence as a strategy, but that didn’t mean we didn’t understand that we are at war with war, that we seek to take the power of the powerful, or that we are coming off the defense and onto the offense. We wanted to turn a corner. Something had to blow up our inertia. But “the box” is perhaps a more useful metaphor, because we have been working literally and figuratively in boxes. We concentrate inside static spaces, whether buildings or the mall in Washington DC, and we stand there and talk to each other…at each other. The “vanguards” of the masses, competing for new cadres out of a tiny pool of the most ideologically “evolved” compete for their market share in the leftist box, and in any competition for market share we emphasize not our unifying points, but our differences. Here is the very basis for left sectarianism. The limousine liberals and trade union bureaucrats—ever interested in maintaining control over the rank and file, and thoroughly deluded by the illusion of a static universe—pursue sterile majoritarianism, and work to consolidate not their most advanced base, but their most conservative. 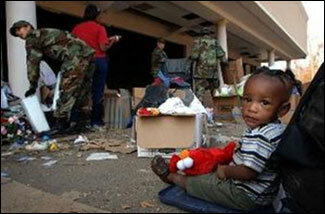 Meanwhile, the rulers can ignore us, maybe throw us an election like a scrap to starving dogs. Boxes. And we wanted out of them. On the afternoon of the 13th, the American Friends Service Committee set up the “Eyes Wide Open” display at the warehouse, while we conducted a brief news conference outside. 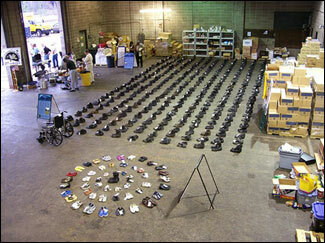 The display is of boots representing the dead GI’s and civilian shoes to represent the Iraqis killed. Our first meal was being prepared in a collaborative effort between the Stone Street Baptist Church and Grumble, our chief cook volunteer from an Idaho collective called Seeds of Peace. By 6 PM, there were over 70 people there. A map of the US had been drawn by some of the youngsters, with help from VVAW, on a bolt of cloth big enough to cover the side of a bus, and people were singing their names where they had come from. Hawaii. Minnesota. Maine. Texas. They were coming in from everywhere. Five documentary film crews were already on the scene. People were catching the sense already that something was about to happen. Many who were just introducing themselves would become fast friends in the days to come. Paul and Vivian welcomed everyone, and after the press conference, when people had been briefed on general instructions for the march, we held a candlelight vigil outside in a strong wind. Paul set the stage with the inspiration we had used for our motto: Every Bomb Dropped on Iraq Explodes Along the Gulf Coast. 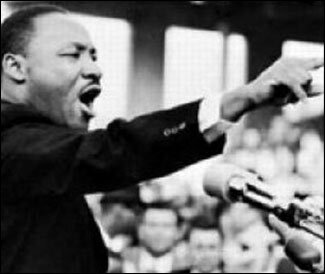 That inspiration was Dr. Martin Luther King’s Riverside Church speech against the Vietnam War in 1967, now remembered as his “Beyond Vietnam” speech. King went from fame to infamy with the establishment during that speech, because he had crossed the line of pluralism and started to talk about the system and a program to correct it. “The war in Vietnam is but a symptom of a far deeper malady within the American spirit, and if we ignore this sobering reality...we will find ourselves organizing ‘clergy and laymen concerned’ committees for the next generation. They will be concerned about Guatemala and Peru. They will be concerned about Thailand and Cambodia. They will be concerned about Mozambique and South Africa. We will be marching for these and a dozen other names and attending rallies without end, unless there is a significant and profound change in American life and policy. “In 1957, a sensitive American official overseas said that it seemed to him that our nation was on the wrong side of a world revolution. During the past ten years, we have seen emerge a pattern of suppression which has now justified the presence of U.S. military advisors in Venezuela. This need to maintain social stability for our investments accounts for the counterrevolutionary action of American forces in Guatemala. It tells why American helicopters are being used against guerrillas in Cambodia and why American napalm and Green Beret forces have already been active against rebels in Peru. Our point was and is…the giant triplets are still here, and we are not done with the struggle King articulated that night at Riverside Church. The entire “Beyond Vietnam” speech was played over a sound system to us on the evening of March 13th. Then we slept on the floor of the warehouse and outside in tents. The next day, we would walk. As advertised, we blew a truck horn three times at 6 AM as a kind of collective alarm clock. I watched with a twinge of anxiety the slowness with which we roused ourselves. We did not yet know how our plans for traffic management would work. Paul and Vivian had to stay in Mobile after this action was finished, and they had engaged in protracted and difficult negotiations with both the Stone Street Baptist Church—the elders of which were uneasy with the suspicion that we were engaging in a protest that could become confrontational—and the police, who accepted our right to do the march only with reluctance and with the admonition that we must start and finish at the times announced. 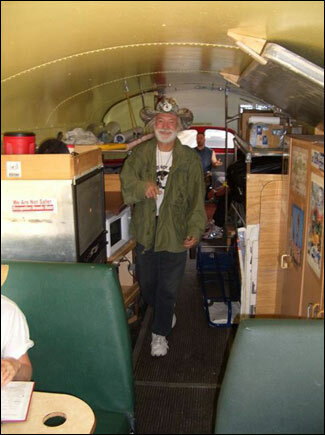 The original plan had been to shuttle all the cars forward to our “jump point” where we would take the long detour to Ms. Mamie Mackey’s land in Bayou LeBatre AL, our first camp site. We wanted to bus the marchers back to start on foot from Stone Street Baptist, but by the time we had fed the crowd of 104 now, we had to just punch straight over to Stone Street Baptist with all the cars, over a dozen beyond the designated logistics vehicles (three buses, three pick-ups, three trailers, and a Penske 24’ “crackerbox”). We parked everything, received a benediction from the pastor, and walked the seven miles to Veterans Memorial Park in Mobile, with a plan to bus-shuttle back to let marchers with vehicles collect their automobiles. 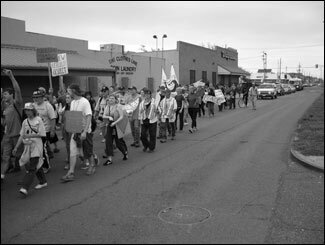 This was when we first started to break up the stereotypes many non-Southerners had about how this march would go…and the expectations of many Southerners as well. We were marching through the Deep South, one of the most heavily militarized regions in the country, a place with extremely high rates of enlistment in the armed services and a stronghold of white conservatism. We had briefed the marchers the day before to answer animosity with friendliness—to engage people around the concerns of their own lives, and under no circumstances to answer anger with anger. This was a prudent warning, and there were a couple of occasions where it paid off. By and large, however, we were enthusiastically embraced. 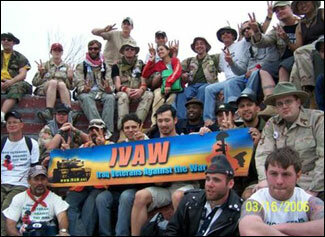 People came out of stores and beauty shops and restaurants and service stations, and while many were neutrally observant, we received thumbs up and peace signs, and even applause as the Iraq vets led the procession with their giant IVAW banner. African Americans were particularly approving and vocal, and the big surprise—which would prove the norm for the next five days—was that truck drivers loved us. 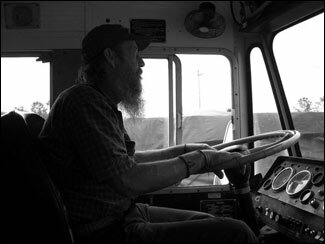 We would lose track of the number of air horns followed by peace signs we received from big trucks.